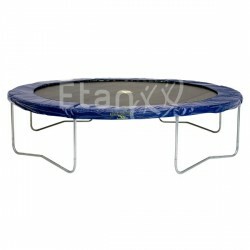 The popular Etan garden trampoline Gold is only available in a nice edge cover in anthracite. 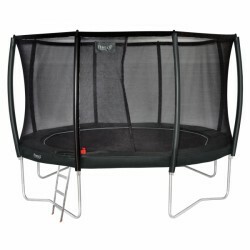 The trampoline is equipped with a thick edge paddking and the delivery includes the Deluxe safety net. Thanks to the excellent jumping features, the Etan Premium Gold gets even coach potatoes outside! Jumping on the Etan garden trampoline Inground Premium Gold makes a lot of fun and trains additionally the motor skills and the coordination. The very loadable jumping mat offers an excellent jumping experience and very soft landings. 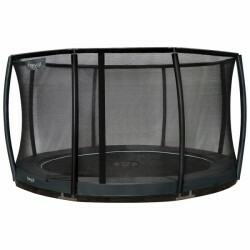 The low design of the Inground trampoline and the precious anthracite are an eyecatcher in each garden! High-quality and nice Inground trampoline for the whole family! Being available in different sizes, the Etan garden trampoline Premium Gold Combi Deluxe does not only convince by quality and safety but also by its diamong spring system. It ensures an extremely comfortably jumping experience, because the jumping power is optimally spread. Including safety net and ladder. Ideal for young and old. Quality, safety, fun to jump - everything combined in the Etan Jumpfree trampoline Exclusive. Experience fun to jump without limits with maximum of safety using this garden trampoline. The extraordinary quality of the Etan Jumpfree trampoline Exclusive makes this garden trampoline unique. 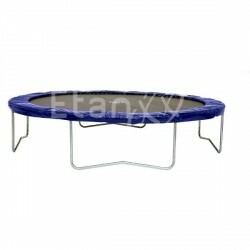 The sturdy Etan garden trampoline Premium of Platinum version has an even thicker and wider padding. This makes the top-quality outdoor trampoline very safe. The stable frame makes the trampoline very durable for use in the garden. Purchase top quality for a safe bouncing pleasure in your garden with the Etan Premium outdoor trampoline. The Etan Premium trampolines have been certified by the TÜV and stricter ASTM in the USA. The Etan Premium garden trampolines are characterized by a great safety and comfort. The safety pad of the Etan Premium trampoline has an extra thick padding for protecting against injuries. The frame stand is extremely robust and durable. Thanks to the special Diamond spring system, jumping on the Etan Premium trampoline is very comfortable. 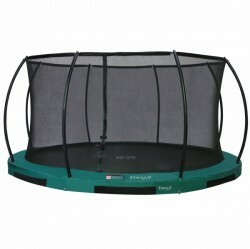 The Etan Hi-Flyer trampoline Inground Set is a great outdoor playing equipment for young and old. The stable frame as sturdy construction in combination with the frame cover and the safety net offer safety while jumping and romping. The High-Flyer set is available in four diameters and can be placed in almost every garden. 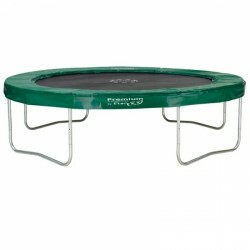 Sports and fun are perfectly combined with the Etan Jumpfree Trampoline Star. Bouncing on this outdoor trampoline does not only reduce stress, jumping on a trampoline does also exercise muscles, coordination, and stamina. Thanks to its padded protective bord, boucing on the Etan Jumpfree Trampoline Star is safe and good for the whole family. The stable frame of the Jumpfree garden trampoline is double galvanized and rustfree. 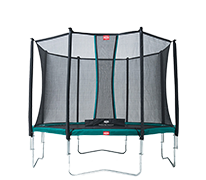 The Etan Jumpfree Trampoline Star is available in different dimensions - that is how you find the appropriate trampoline for your garden !